The most popular Cub is the Piper J-3 Cub which is a small, simple, light aircraft that was built between 1937 and 1947 by Piper Aircraft. With tandem (fore and aft) seating, it was intended for flight training but became one of the most popular and best-known light aircraft of all time. The Cub’s simplicity, affordability and popularity invoke comparisons to the Ford Model T automobile. Piper manufactured 19,073 J-3 Cubs. The aircraft’s standard chrome yellow paint has come to be known as “Cub Yellow” or “Lock Haven Yellow”. Cubs served in wartime as artillery spotters and air ambulances but are best known as trainers for the thousands of student pilots who learned to fly between the late 1930’s thru the 1950’s! One Cub serving with the US Coast Guard actually sunk a German U-Boat during WWII! Today, they are cherished classic aircraft from aviation’s Golden Age! Monte Finley and I both worked at Martin Marietta and we both had Cubs. Mine was a modified Taylor J-2, Monte’s was a 1940 J-3. One day at work we were discussing the “Sentimental Journey” held each year at Lockhaven, PA., where most of the Cubs were built. In passing, we agreed that it would be fun to attend the fly-in, but we decided that the week to fly there and a week back was pretty much out of the question, as we only got two weeks a year vacation. I mentioned we could have a Cub fly-in here in Lompoc. Monte picked up upon that and that set the wheels in motion. With some advertising, we had out first West Coast Fly-in here in Lompoc in 1984. It wasn’t much as fly-in go, with only 10 planes. Five Cubs, a home built, and a couple spam cans, but it was a start. 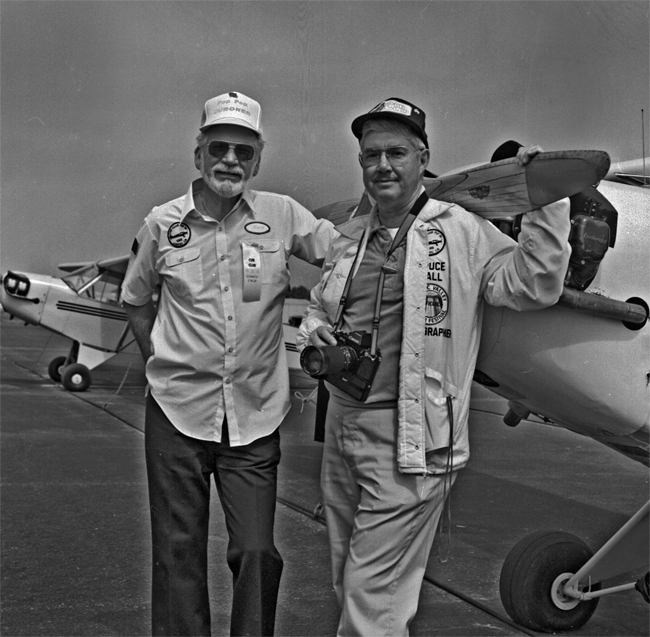 I was willing to quit, but Chet Waite, the FBO at the time persuaded us to try again. So with more advertising, we had another fly-in. This time we had 20 or so planes. Mostly Cubs. It was my idea to have the fly-in at different airports, with the next fly-in to be at Bakersfield, but that never got off the ground. Only two planes showed up, mine and a Cub from the L.A. area. So we tried again this time with much better results. I don’t remember how many planes showed up, but it was heartening as many planes did come. It was more like a real fly-in. At the 10th fly-in we started selling Cub memorabilia, also yellow jackets that Monte designed. 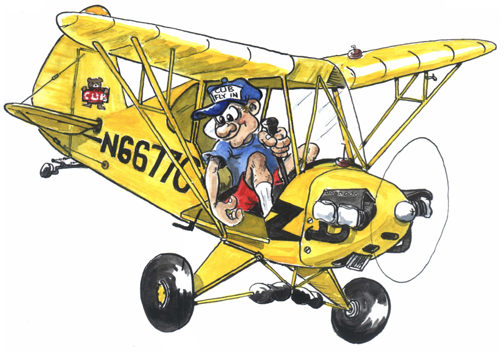 (Monte also designed our Cub mascot – Cubby). The jackets are a Cub yellow with a silhouette on the back and a head-on view of a Cub on the front. The pilot’s name and their N number are embroidered on the front. These jackets have been offered every 5 years.